Air Force won its opener by 35 points. Michigan lost its opener by 27 points on national television in prime time. Who, when and where: Air Force (1-0) at Michigan (0-1), Saturday, 3:30 p.m. Eastern. Gambling is illegal in most states: For those stuck on that earlier question, Michigan is a 21.5-point favorite. Patriot pride: The Wolverines, still ranked 19th by the AP and the USA Today Sports Coaches’ Poll despite a 41-14 loss to the New England Patriots top-ranked Alabama, need a dominant win over Air Force to rejoin the ranks of national title contenders. Air Force head coach Troy Calhoun ranked Michigan ninth on his coaches’ poll ballot, no doubt because they ran into what he called “the most talented team in all of football right now” in the season opener. And yes, Calhoun went on to say that the Crimson Tide rank right up there with the Tom Brady-led Patriots when it comes to on-field ability. The obvious question: What is the opposite of “bulletin-board material,” and can Calhoun apply for a patent? 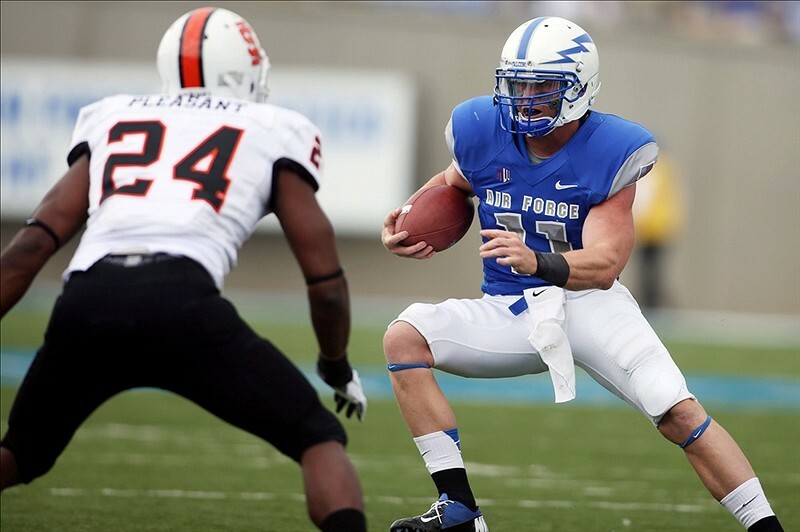 Running away: Air Force didn’t play the Patriots, or the Crimson Tide, or even a Football Bowl Subdivision team in its opener, but its rushing totals against Idaho State remain remarkable — 484 yards, 8.3 yards per carry and seven rushing touchdowns, four by senior Cody Getz. Getz piled up 218 yards on 17 carries against the Bengals, but don’t expect the 5-foot-7, 175-pounder to duplicate that performance against a Big Ten defense, especially without a key part of his offensive line. Robinson’s return? : Alabama made Michigan quarterback Denard Robinson, a preseason Heisman contender, look downright average Saturday, holding him to 27 yards rushing and an 11-of-26, 200-yard passing performance while picking him off twice. The (Colorado Springs, Colo.) Gazette’s resident Air Force football guru Frank Schwab lays it out here — for Air Force to hold Robinson to anything close to those numbers, it’ll need outside linebackers Alex Means and Jared Jones to play well above their heads. Even if Robinson’s running game is contained, he could do some damage in the pocket. Last week, Idaho State QB Kevin Yost threw for 355 yards and two touchdowns against the Falcons defense. Also helping Robinson’s chances: Running back Fitzgerald Toussaint returns from a one-game suspension, giving the Michigan offense a much-needed running threat aside from its quarterback. The best option: The CBSSports.com game preview may have put it best, listing Air Force’s option offense under the “Watchability” header. It’s a polite way to say that the offensive system used by the Falcons (and, in one form or another, by Army and Navy) could help make up for the size and speed advantage held by the Michigan defense. As with all option attacks, that puts the running and passing pressure squarely on senior quarterback Connor Dietz, whose split-second, on-the-run decisions will either keep defenders off-balance … or hand the ball to Getz and others just in time to meet a Michigan welcoming party. As good as the Patriots? Really? : In fairness to Calhoun, if you’re going to get an evaluation of NFL talent from someone who walked the Air Force sidelines, it might be this guy instead.